Blue light enters our eyes from natural sources like the sun. Our eyes are also absorbing blue-violet light from digital sources on a daily basis. Over time, our eyes are exposed to various sources that emit this blue-violet light in LED lighting, tablets, TVs, computer screens and smart phones. 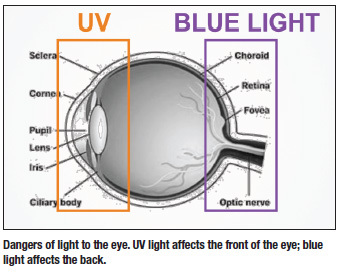 This cumulative and constant exposure to the blue-violet light is going to accumulate over time and has the potential to cause damage to the retinal cells, which is going to slowly lead to retinal cell death and can in turn lead to Macular Degeneration. Nowadays, there’s an increase in the use of digital devices and modern lighting—such as LED lights and compact fluorescent lamps (CFLs)—most of which emit a high level of blue light. CFLs contain about 25% of harmful blue light and LEDs contain about 35% of harmful blue light. Interestingly, the cooler the white LED, the higher the blue proportion. And by 2020, 90% of all of our light sources are estimated to be LED lighting. So, our exposure to blue light is everywhere and only increasing. A circadian rhythm is a roughly 24 hour cycle in the physiological processes of living beings, including plants, animals, fungi and cyanobacteria. In a strict sense, circadian rhythms are endogenously generated, although they can be modulated by external cues such as sunlight and temperature. [+ harmful modern lighting and digital sources]. Circadian rhythms are important in determining the sleeping and feeding patterns of all animals, including human beings. There are clear patterns of brain wave activity, hormone production, cell regeneration and other biological activities linked to this daily cycle. These findings have important implications for understanding how modern light exposure patterns contribute to late sleep schedules and may disrupt sleep and circadian clocks. The biological effects of light profoundly influence human physiology and behavior most notably permitting vision. Light also affects many non-image forming biological systems in humans and has been shown to increase physiological arousal and enhance cognition, disturb sleep, and permit the synthesis of vitamin D[2,3,4]. Light is also used medically to treat conditions such as jaundice, skin disorders and winter depression[2,5]. A key non-image forming response to light is entrainment of internal circadian clocks[2,6,7,8,9,10], which permits organisms to synchronize to environmental time allowing physiological functions to occur at optimal times of day. Natural selection favored the human circadian clock system to promote energy intake and metabolism, physical activity, and cognition during the light portion of the day, and to promote sleep and related functions during darkness at night. Yet, the external lighting environment was dramatically altered in the 1930s when electrical power grids in North America and Europe provided electricity to power electrical lighting for the masses permitting humans to spend more time being active in indoor constructed environments. This ability to control our daily exposure to light with the flip of a switch has contributed to an increase in indoor activities and has expanded work and play hours far into the night. 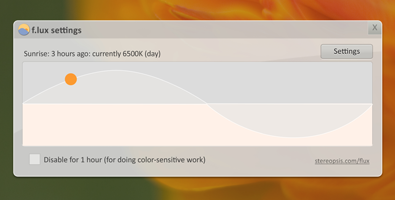 In the current study, we quantified how much electrical lighting and the associated reduction in exposure to sunlight in the constructed environment has altered the timing of the human circadian clock by comparing the effects of exposure to electrical plus natural light (referred to henceforth as electrical lighting-constructed environment) to that of exposure to only natural light. If 90% of all of light sources by 2020 are estimated to be harmful LED lighting, is this another silent weapon? New solid state drive computers no longer provide an ethernet port to access internet through cable. How many people realize they are exposing themselves to harmful electromagnet radiation from wireless technology? Those who care, can purchase a USB ethernet adapter sold separately. Please share, to inform others so they can help themselves and family. This entry was posted in Public Notice, Silence is agreement. Bookmark the permalink.